I know this looks like a white polish. It's not. Herôme W.I.C. Mykonos is a very, very pale mint green. I expected more green on the nails but it's so subtle that it looks almost white. A disappointment, if you ask me. 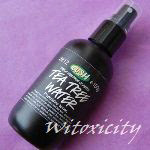 It has a sheer formula with shimmer and I applied four coats. I could have done a fifth, but I got tired. Herôme, by the way, is a sister brand of KOH, with Herôme positioned as a mid-price player and KOH on the higher end. Herôme polishes retail for around €7 (different stores have different price tags) for a 7ml bottle. The W.I.C. in the name stands for World Inspired Colours. It's commonly known that Herôme polishes thicken after a while. I've had Mykonos for many months and indeed it had thickened a fair bit. As with my previous experience with Herôme Ottawa, Mykonos took a long time to fully dry. I did wait for at least twenty minutes between coats but still, I had a deep dent in one thumb three hours later. And just like Ottawa, when it's really fully dry, it's pretty hardy. I'm not a fan of white polishes. I bought this only because I wanted a pale mint green polish. Mykonos the polish turned out to be so plain. It needed some stamping. 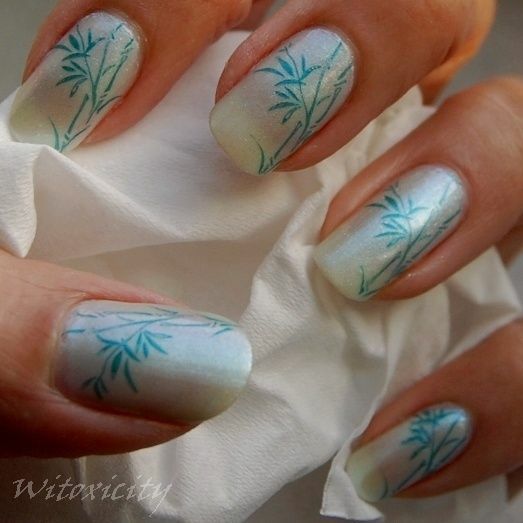 So, I chose the bamboo design from the KONAD plate M66 and used the green of Etude House Petite Darling GR603. 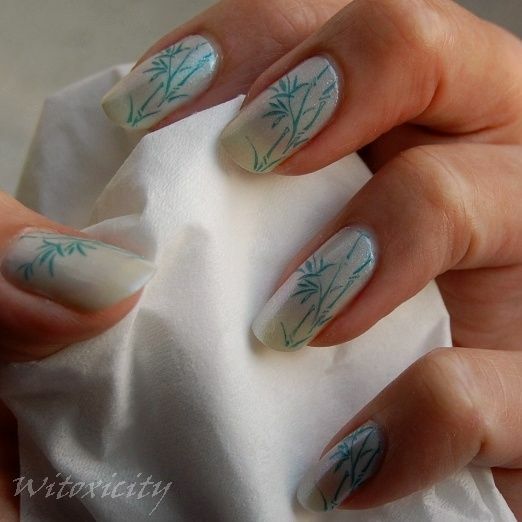 I like the delicate design of the bamboo on the nails. it looks terrific with the konad. The green sheeny glow in it reminds me of Maybelline Express Fairy Pretty which has multi colored glitter in it and is one of my favorite top coats. I bet Mykonos would do well as a top coat too. How pretty! Love the design! 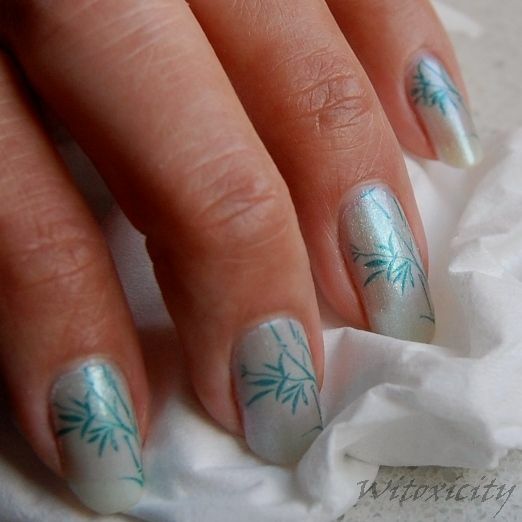 you are so talented with nails. and i love this sparkly mint green. Its so pretty. I always like your honesty in your posts! Thumbs up for that! Your nails are beautiful, your photos are awesome and the design is pretty, but what can I say about the nailpolish....You applied 4 coats and you could have done a fifth one, it doesn't dry fast enough, it easily dents, it thickened, plain disappointing color..Not a very good buy, right? Well yes, this polish is a disappointment in general. I should have used a white crème polish as a base layer to save me the trouble of applying so many layers, but then again, this polish is just meant to be a sheer. I was trying to be adventurous when I bought this - deliberately choosing a colour that I'm not automatically drawn to, as I love dark shades, not light. We all learn something new as we go along. I have to agree with Nicole....I still see many bloggers rave about products simply coz they got them for free!! How lame is that! They are not objective. Like nobody notices that. I have to applaud you for that. As for the polish, I'm like you I like dark colors, but still the stamping looks great. € 7 for a 7ml bottle and this quality is way too much. I think there are a lot of other cheaper alternatives out there. Hi, KTee! Thank you very much for your words of support! I know what you mean, my dear. It's tricky territory there for sure. I've been thinking of buying that konad plate for days...now that I've seen your nail art, I HAVE to get it!! 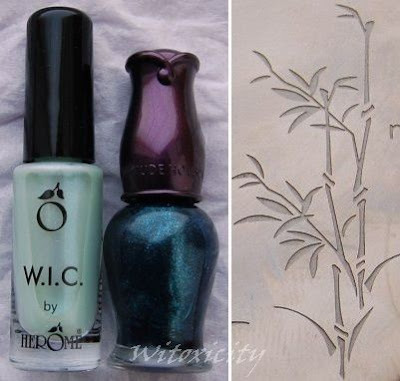 I've never seen a polish quite like the WIC one, it's really gorgeous! !